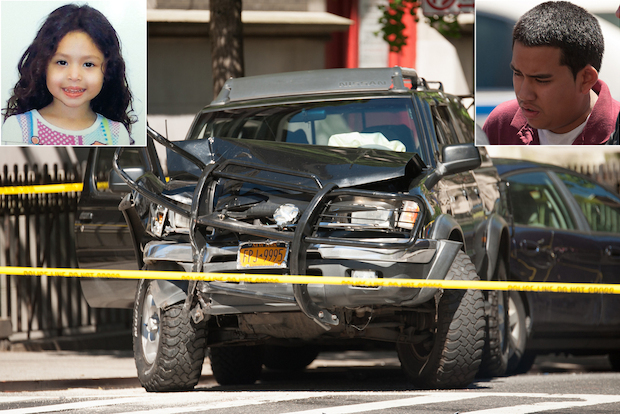 MANHATTAN — A beautiful 4-year-old girl was killed Tuesday morning while walking with her grandmother to her daycare center on the Upper West Side when an unlicensed teen driver fleeing cops in an SUV struck them, according to police. The babyfaced driver — a student at an all-boys Catholic high school — slammed into the toddler and her grandma with his black Nissan Frontier about 8:20 a.m. after making a sharp left turn onto 97th Street off Amsterdam Avenue as he tried to shake three cop cars, police said. The crash pinned little Ariel Russo and grandmother, Katia Gutierrez, against the metal grating of a restaurant. The driver, Franklin Reyes, then reversed the SUV, striking Gutierrez again before cops stopped him. The girl was rushed to St. Luke's-Roosevelt Hospital in cardiac arrest and was declared dead on arrival, police said. Gutierrez was in stable condition at St. Luke's. "We have a lot of pain for this little girl," Ariel's broken-hearted grandfather Paolo Russo, 71, said in Spanish outside the hospital. "Last night, I saw her dancing in a video and this morning I get a phone call that she's dead." Witnesses who saw the crash said the horrific scene erupted in a blur. "All I saw was a black truck go across, pick the lady up, and then her and the baby crashing down. I just started screaming," said witness Tashia Jackson, a 27-year-old home health aide. "The body went up and hit the floor." "The truck backed up, ran over [the grandmother] again," she added. Police said Reyes was treated at Mount Sinai Hospital for breathing problems. Wearing his maroon school uniform, he was hauled into the 24th Precinct station house Tuesday afternoon and charged with manslaughter and vehicular manslaughter. The teen told detectives that he panicked when the cops pulled him over because he doesn't have a driver's license and wasn't supposed to be using the black 2000 Nissan Frontier SUV, a source said. Police have so far been unable to determine who owns the Nissan; the vehicle has not been reported stolen, sources said. Reyes said he felt badly about the accident, but investigators were uncertain if his remorse was for Ariel or himself, sources said. He hadn't been told that she was killed, sources said. A junior at St. Agnes Boys High School on the Upper West Side, Reyes was on his way to school for his last day of classes, according to sources. A spokeswoman for the Archdiocese of New York's education division would not confirm whether Reyes attended the school, citing privacy concerns. "It's one of those tragic situations," said his lawyer, Martin Schmukler outside the 24th Precinct stationhouse Tuesday night. "It's really an accident. He shouldn't have been driving. It's as simple as that." Minutes before the chaotic chase and crash, cops spotted the teen driving recklessly at 89th Street and Columbus Avenue, according to police. He was pulled over at 89nd Street and Amsterdam Avenue, but when cops got out of their vehicle and approached him, the teen sped off northbound on Amsterdam. "As officers were at the door, he gunned it," NYPD spokesman Paul Browne said. Three cop cars with their lights flashing then chased the speeding SUV up Amsterdam Avenue, he added. "The police were behind him, they were chasing him," said Nancy Cabrera, 30, an Associated Supermarket manager who saw the crash. She said after the crash, cops yanked the driver out of the SUV. "The boy tried to run, they pulled him out of the car, put him on the ground, and then stood him up," she said. Reyes was arrested for an armed robbery in Nassau County in October, according to records. At Reyes' home in Chelsea, staff at the five-story building described him as an average teenager. "He's a very good kid, never got into trouble," said Kenny Albert, who works at the building, adding that he had never seen Reyes behind the wheel of a car. The Upper West Side neighbors of the grandmother described her and little Ariel as an inseparable pair who took frequent walks with one another. "The family went everywhere together. They were always together," said Shirley Williams, the tenants association president of the grandmother's building. Williams described Ariel as having long, flowing hair and a gregarious personality. "She looks like a mermaid," she said. "She would always say hi and wave to us." "She always had ice cream," Williams added. "She would say, 'I've got my ice cream.'" Paolo Russo said Ariel's mother was from Nicaragua. The girl's parents were in shock, he said. "The family is inside with the girl. They are devastated," he said. "This was a tragedy, and we are all very sad. We're mourning her loss." Steven Davis, 28, who lives on the third floor of the building directly above the crash, said he ran downstairs after hearing the sound of the crash. "When I first saw them, I thought they were both dead, they were both motionless," he said. "I only knew the grandmother was alive because she was talking." Jeff Potter was just starting his day in his eighth-floor apartment nearby when he heard the collision. "I heard the squeal and then the metal crash," said Potter, 58. "It's that squeal and that crunch that you don't want to hear."